The last year has been a difficult time for migrants and for housing providers. Housing providers face increasing demands on them to do more with less, while struggling to keep faith with their tenants and to be fair to all. The toxic debate around Brexit and the government commitment to creating a “hostile environment” for some has brought discrimination and sometimes fear into the lives of many migrants. Migrant destitution and homelessness is a growing problem. We need to find ways to work well in these hard times. 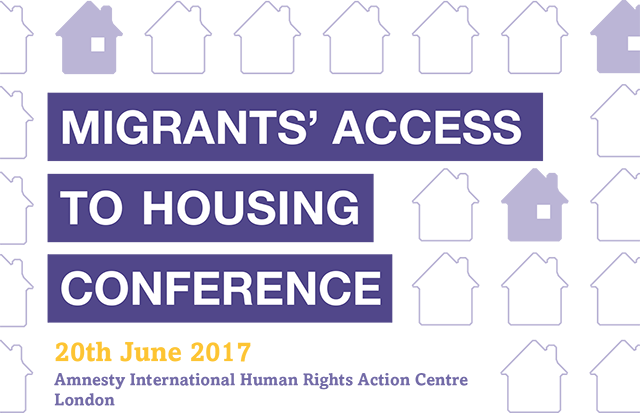 So ARHAG and Innisfree housing associations and Praxis Community Projects commissioned MigrationWork to organise a first Migrants’ Access to Housing Conference to explore what we can do. We quickly got the support of major figures in the housing world and London government. Today we find out what we can do and what may come next. Sue Lukes is a director of MigrationWork and co-edits the CIH/BME national website www.housing-rights.info. Barbara Roche is a former Member of Parliament and Government Minister. In government she served in the DTI, Treasury, Home Office, Cabinet Office and the Office of the Deputy Prime Minister. At the Home Office, she was the Minister for Immigration. Arhag was set up in 1979 as a community organisation to support African refugees who were experiencing housing problems. Arhag registered as a housing association in 1988 and started to develop permanent homes in 1989. Arhag still, primarily, house refugees and migrants but now from all countries and continents. Praxis is a human rights’ charity that has been supporting migrants and refugees in London for over 30 years. They provide a holist ic range of services including specialist immigration advice and casework, housing, group work and advocacy. They build innovative cross-sector partnerships to find sustainable solutions to migrant homelessness and destitution. Their frontline expertise in forms their training courses, which support service providers to work more effectively with migrants and refugees. Innisfree is a housing association providing high-quality affordable homes, proud of their Irish roots and their experience in working with migrant communities. Established in 1985 to meet the housing and support needs of the Irish communities in London they now own and manage over 550 homes predominately in the London Boroughs of Brent, Camden and Haringey.